There are so many great things about blogging (and a few icky ones but let's be positive here folks), but probably one of the best aspects is having the opportunity to try brands that I haven't tried before. Now Laura Mercier has been around for a number of years, but it was not a brand that I ever tried prior to blogging (I know, where have I been?). Fast forward 2+ years and a handful of my holy grail products are from Laura Mercier. If you don't believe me, just click here to scroll back through my blog and see all my reviews. The range of products she is most known for are complexion products, which are essential to creating Laura Mercier's famous "flawless face". And since I have a few of her foundation products, powders and concealers, I can attest to their ability to create a virtually perfect complexion. Even though I am quite confident in my makeup applying abilities (I did work behind the makeup counter for years), I was excited when the Laura Mercier team asked me to go visit my local LM counter and sit for a complete makeup consultation in preparation for this post. Frankly, it was one of the best experiences I've had in a long time and it reminded me why it's important to go back to a counter now and again to get that professional experience. A flawless face creates the perfect setting for the rest of the makeup. Starting with a clean, even face is like starting with a great palette. Letting one's natural skin show through is very important in creating a flawless face. Decide what finish and texture you want before exploring different foundations. If you don't know, explain to the beauty consultant what sort of skin you have, your concerns and your lifestyle. When choosing a foundation color, it is always best to choose 3 shades and swatch them on the chin. Start by the lip and pull down to the neck to make sure it matches completely. Use your finger to press it into the skin and the color that disappears is your shade. When applying foundation, start in the center of the face and blend outwards towards the hair line, ears and jaw. Use a damp sponge or fingers to apply the foundation. The warmth of the fingers helps the foundation disappear into the skin. This can be a matter of preference, but after seeing the makeup artist apply both the primer and foundation with her fingers, I was amazed at how beautifully it blended into my skin. The steps to the Laura Mercier "flawless face" are: skincare, primer, foundation/tinted moisturizer, concealer/secret camouflage and setting powder. Here is my finished look with just the primer, secret camouflage, and tinted moisturizer, with a touch of bronzer on my cheekbones. I was amazed at how everything came together to give the most beautiful, but natural coverage and a true "flawless face". If you are new to the Laura Mercier brand, below is a cheat sheet for my recommended products to try. I have starred the must-have essentials. Foundation Primer* - Laura Mercier is one of the original makeup artists to speak about using primer, so you can be sure these are some of the best around. There are a few different ones for various skin types, but I prefer the original primer while another popular one is the Radiance Primer. See all her primers here. Tinted Moisturizer* - Always on the best of beauty lists, this truly is flawless skin in a tube. Weightless on the skin, it gives a natural satin finish. I prefer the Original Tinted Moisturizer in the shade Porcelain, but there is an oil-free version as well. Smooth Finish Flawless Fluide - This is her newest foundation to launch and it's a stunner. An oil-free formula that gives medium coverage and blurs imperfections. It has an impressive shade range - 24 to be exact, great for any skin type (which is rare for a foundation), and is one of my favorite formulas. It is quite unique in that is has to be "activated" before use by shaking the bottle for 10 seconds, and once it's applied, it's like pure perfection. If you care to see me sing its praises even more - I reviewed it on the blog here and in this video. Told you I liked it. Secret Camouflage Concealer* - Your dark circles, skin imperfections and discolorations have met their match with this concealer. It's a cult classic because it allows you to mix two shades together to help color correct and get the perfect shade for your skin. Invisible Setting Powder* (Loose or pressed. I have both. Yup, obsessed.) - This is hands down one of the best powders I own, and it works for any skin tone. It never fails to set my makeup and keeps it looking flawless and matte ALL. DAY. LONG. And don't forget the puff! Using the puff has made all the difference. I apply to the skin in a press/roll method for an invisible and gorgeous finish. Full Blown Lash Volume Mascara - I am a mascara junkie, so I can appreciate a good formula from a bad one. I always keep a tube of this around to use as a base mascara because it gives the most perfect separated and lengthened lashes. Often thicker formulas can clump too easily so using this first is always guaranteed to give me a fuller look without the lashes sticking together. Lip Glace - I always say I not here for lip glosses, but then I find another one that I adore. These definitely have a creamier feel on the lips than typical glosses so I enjoy wearing them alone or layered over lipsticks. Creme Smooth Lip Color - Being a lipstick lover (and lover is putting it mildly), the Creme Smooth formula satisfies my lipstick checklist. Intense color. Check. Wide range of shades. Check. Smooth and comfortable on the lips. Check. I am on my 6th color from this range and don't plan to stop any time soon. Caviar Eye Stick - If you don't love the ease and simplicity of an eye shadow stick, I am not sure we can be friends. These Caviar Eye Sticks are ideal for any occasion because they go on easily, blend smoothly, come in a gazillion colors and set for all day (or night - heyyyyy). Matte Radiance Baked Powder Compact - To find a bronzer pale enough for me and with just the right amount of shimmer vs matte properties is nearly impossible. However, Laura Mercier's baked formula manages to do the impossible. I call it my "vacation in a compact" because it imparts the perfect amount of color without turning my face into an ooompa looompa. I hope my tips and recommendations come in handy if you are looking to explore more Laura Mercier products. All her products can be purchased at Nordstrom, Sephora, Bloomingdale's or LauraMercier.com. And to end on a fun note, Laura Mercier is currently running an Instagram contest where you upload a picture of your "fresh face", use the hashtag #LMflawlesscontest and be entered to win $1000 (um hello, that is enough makeup for a lifetime) worth of Laura Mercier products. Contest begins October 14th. Disclosure: This post was sponsored by Laura Mercier through her partnership with POPSUGAR Select. 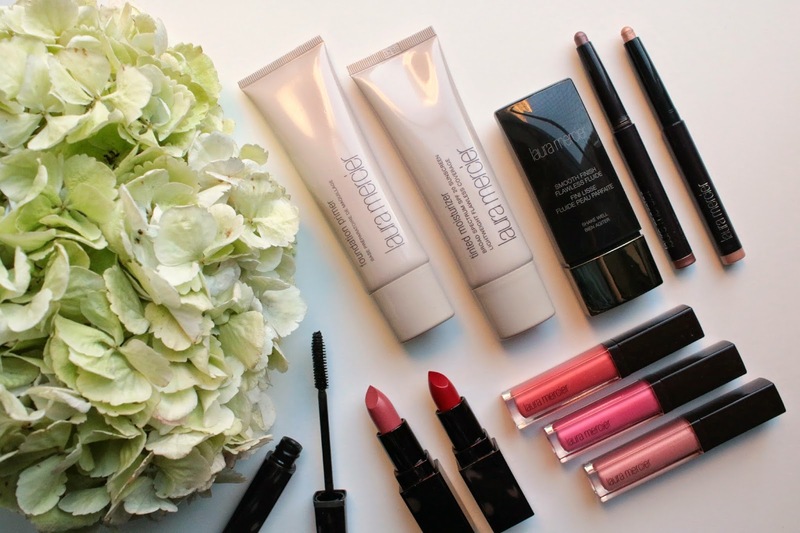 While I was compensated to write a post about Laura Mercier, all opinions are my own. Thank you for all of the recommendations, this post was so informative! I have a couple of products from the brand, a lipstick and primer and really like both of them, but I definitely need to explore the range more! Thanks! Her complexion products are truly some of the best around. And her bath products! I forget to mention them but they are amazing.